This Victorian Era antique dirk features sterling silver fittings with an very ornate thistle design. It’s over all condition is Good. It’s country of origin is Great Britain. 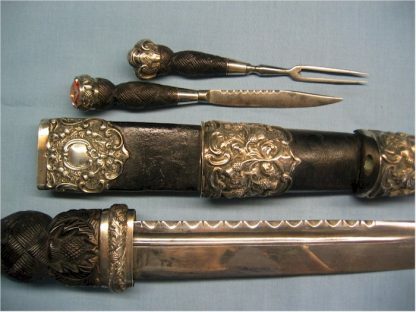 The stone on the small fork was lost and replaced at some time with a sterling silver pommel. There is no maker’s mark. The antique dirk blade has slight wear. 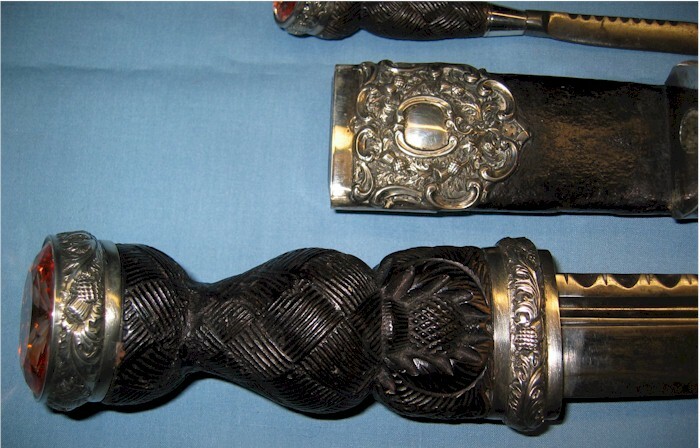 The small fork has a sterling silver pommel. The stone was lost and replaced at some time. Dirk fittings have a very ornate design with thistles. There is no maker’s mark.